If you are assembling your playscape a piece at a time, as you can afford it, you will love this low cost alternative for adding a tunnel. 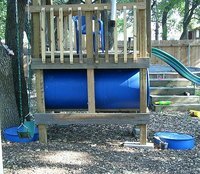 Using recycled plastic barrels as the base you can create a safe and fun tunnel for your little one to crawl through. Measure distance between two bottom rungs of playscape. Add two inches to allow for overhang. Divide by two. This is how tall your barrels need to be. Turn barrel up with bottom facing up and measure from ground up to that location. Mark distance all around both barrels and cut. Drill matching holes periodically around both barrels on the cut end. They must align. Use scrap plastic or metal connectors and put in bolts and nuts to connect the two barrels. Run bolts from the inside out. Cut a piece of weather-stripping long enough to go around entire inside of barrels. Trim off both edges so you are left with a relatively flat piece. Lay out flat and cover with rubber cement. Cover inside of tunnel, where it connects, with rubber cement. Cover a spot at least as wide as your weather-stripping. Wait 15-30 minutes and press weather-stripping into place. Start and end at the bottom of the tunnel to prevent rain or water from seeping in. You can either spend the next 10 minutes or so repressing the stripping into place or you can find items to push into the tunnel to compress and keep the weather-stripping in place while it dries. You can also use very small screws to secure it in place if necessary. Cut a 2x4 long enough to fit across top of supporting base, parallel to proposed tunnel location. Place tunnel up against a side of playscape and push 2x4 against other side to help stabilize it. Screw 2x4 into playscape base. Cut a 2x4 long enough to fit inside supporting base. Screw in place directly under the tunnel to add support. Using screws and washers secure tunnel to playscape any where it touches wood. Use cut off ends of barrels as steps up to tunnel. Many assembly-type companies receive parts in plastic barrels. You may be able to pick them up for free or very little. Try your local craigslist or freecycle. You can use a split bike inter tube or any other kind of flexible rubber item at least 3 inches wide in place of weather-stripping. When you acquire barrels ask what was shipped or stored in them and if it has any dangerous side effects. Make sure the person you get them from knows how they are being used.